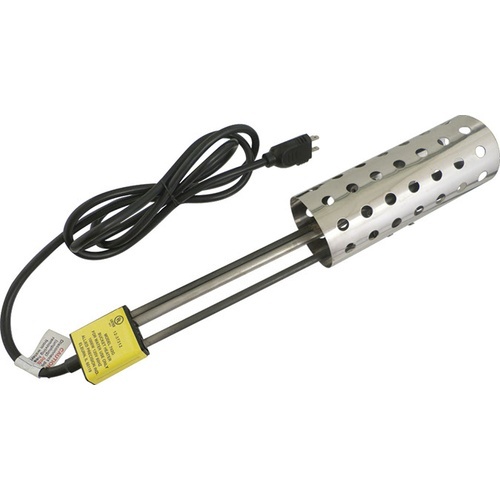 Preheat your mash before beginning the brewing process with this 1000W Electric Bucket Heater. This handy little tool works in conjunction with a product like the Ranco or Johnson temperature controller by enabling you to set an exact hot liquid temperature on the controller, and then attaching it to the bucket heater. The temperature controller will turn off the bucket heater once it reaches your desired temperature. Our bucket water heater is designed to use with water in a bucket or cooler where an open flame cannot be used, and you can even use it to heat a bucket of water for cleaning with a powdered brewery wash. This water bucket heater measures 17 inches from the handle to the tip and comes with a 6-foot long cord. It requires at least 6 inches of water for full submersion, and it can only be used with a maximum depth of 14 inches. Unit has stainless steal heating element and guard. Does not include clip for mounting. Please Note - Having electrical devices around liquid can be hazardous, and should not be left unattended. Please use caution while using this device, and read the instruction manual prior to use. My homebuilt version died. I use it to augment the weak gas stove. To assure that my mash (in my cooler) hits and stays at the appropriate temperature to produce the right combination of fermentable and non-fermentable sugars, I carefully monitor the temperature and stir as needed to eliminate temperature stratification. Opening the color mash tun to stir can result in temperature loss. I am considering purchasing the electric bucket 1000 watt heating element as a means to bring the mash temperature up after it drops (or if I was low following doughing-in). I would stir the heating element to prevent hot spots in the mash. Does anyone see a downside to doing this? It would appear that this would be similar to what the mash would experience in a RIMS system. Thanks. BEST ANSWER: The bucket heater is a fine tool when used in the correct situation. I use mine to heat sparge water, and it takes over an hour to get it up to 168deg. Two things on your intentions for using it in your cooler mash tun. First, I don't think it will provide adequate heat to heat the mash. Second, the shield around the heat coils will prevent you from removing mash away from the coils as you stir. I used a cooler to mash for quite awhile, and found it worked very well. If I ever had to raise the mash temperature, I would use a decoction method. This worked well. I now use a different system, different equipment, and recirculate the mash. To be honest, I don't notice much difference. You would never be able to raise your strike temp over a degree or so with this heater once you start mashing. I think it would be a nightmare to clean afterwards. The way I use the heater is with a simple temp controller to heat my strike water, thus preheating my mash tun a the same time. I rarely lose one degree over a 60 minute mash, even stirring every 15 minutes. 10 gallon Igloo water cooler. Thank you for the quick reply Lee. I was hoping to use the heater to bring the mash temp up a couple of degrees if I miss the target when mashing in or following periodic stirring of the mash to eliminate the hot and cool spots in my 10 gallon retangular mash cooler. Also been trying find a means to stir the mash without opening the cooler. Thanks again. The only downside I see is that you could scorch the grains by putting it directly in the mash, but it’s may not happen if you are stirring continuously. Well made unit. I purchased this to be able to stabilize and pre heat my Igloo Mash Tun. I started with approximately 5 gallons of 125 degree water. I then inserted the bucket heater and set the temp controller to my mash temp of 152 degrees. It took about 70 minutes to bring the temp to 152. This is not a problem if you plan ahead. The whole time it is heating, it is stabilizing the mash tun. By doing this, I had less then 1 degree drop, over a 60 minute mash cycle. Best stable mash temp I have ever had. A good practice is to stir the water while it is heating every now and then. Be sure and control it with a controller and you will not overshoot your temp again. When I first got this, it would heat my strikewater to about 150f overnight in the garage. Ambient temps were cold, cold, cold. Now, after a few months, it can only heat to about 110f in the same amount of time. Ambient temps are now warmer. I'm left to believe this thing is losing some effectiveness. Pretty disappointing. It is still a nice headstart, but I find myself having to use propane to get up to strike temps more than I want. I use it throughout brew day along side propane. Whatever btu's I get out of it are cheaper than propane. Works great in a Corny keg. I keep a Corny keg 1/2 full of PBW solution. This works great to heat it. Then I dump in conical or keg washer as needed. When done I pour back into corny keg and use for a few more rounds of cleaning. Also a good way to heat rinse water. 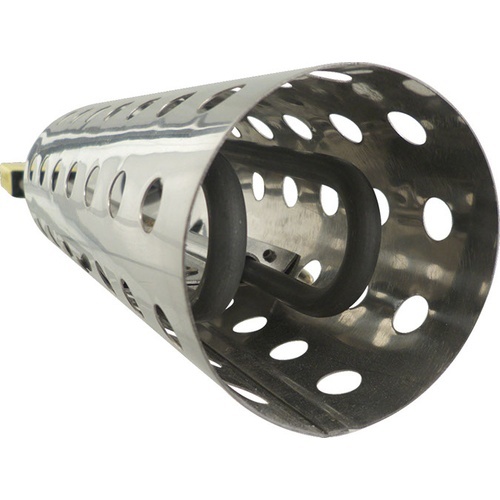 Another name for this product is a bucket heater. I use it to heat 8 - 10 gallons of strike water in a Keggle. (more than 10gallons and you'll start covering the plastic parts of the heater). I want to warn you, this thing is SLOWWWWWWW. I turn it on when I go to bed and let it run overnight. My water is at about 170F when I get up. It gives me a great start on my day when I have my strike water and crushed grains waiting on me in the morning. I'll give this four stars just because of it's slowness.... but then again, it is probably the fastest that you'll get out of 120V.